Eight-figure pay cheques are not hard to come by for young Indian executives. Even a relatively young company like Flipkart possibly has more employees with fat cheques of Rs 1 crore than IT behemoths Infosys and Wipro combined. And, in a trend that is fast catching up, pay cheques that run into crores are being shared equally by professionals and promoters. The recently published list of top 10 highest-paid executives for 2016-17, too, established the drift. Sticking to the norm, the list of executives under 40 with annual salaries of Rs 1 crore, or more, at listed Indian firms was also equally split between promoters and professionals. Out of the 62 crorepati executives, 30 belonged to promoter families while 32 were self-made professionals. While TVS Motor Company’s joint managing director Sudarshan Venu topped the list with Rs 10.24 crore in remuneration, his elder sister Lakshmi Venu, joint managing director at Sundaram Clayton, was at the second spot with Rs 6.10 crore. 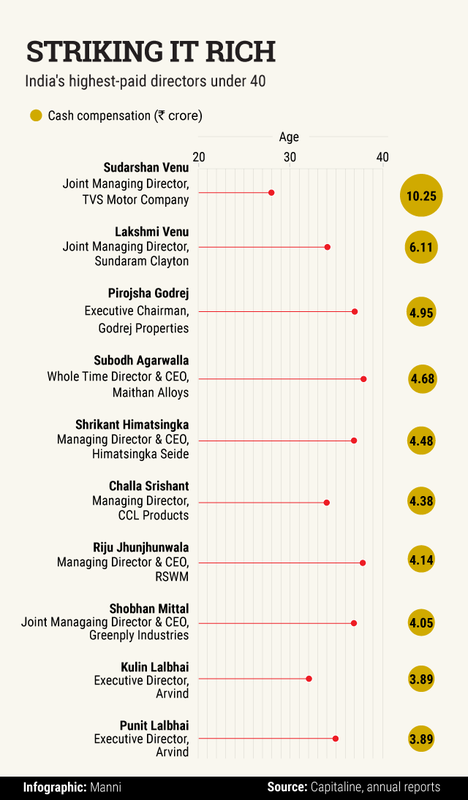 Lakshmi Venu had also featured in the list of highest-paid women executive directors in India. Sundaram Clayton is the holding company of TVS Motor. Pirojsha Godrej, who succeeded his father Adi Godrej as the executive chairman of Godrej Properties in April 2017, was the second runner-up with Rs 4.94 crore. The fourth and fifth spots, respectively, went to Subodh Agarwalla, the promoter and CEO of ferro alloy manufacturer Maithan Alloys, and textile company Himatsingka Seide Ltd’s managing director and CEO Shrikant Himatsingka. Punit and Kulin Lalbhai, the scions of Ahmedabad-based textile conglomerate Arvind Ltd, also featured in the top 10 with remuneration of Rs 3.88 crore, each. The list of highest-paid executives under 40 years was drawn up by collating and screening data from Capitaline and the annual reports of listed companies. Also, the analysis takes into account only cash compensation. Compensation details of directors and employees of unlisted private companies were not available in public domain. Among the 32 professionals employed with listed companies, Godrej Properties CEO Mohit Malhotra was the highest paid non-promoter executive with a cash compensation of Rs 3.64 crore. Bharti Airtel’s chief innovation officer Kartik Sheth walked away with Rs 2.44 crore. Sheth is also the managing director of Wynk Ltd, a wholly-owned subsidiary of Bharti Airtel. 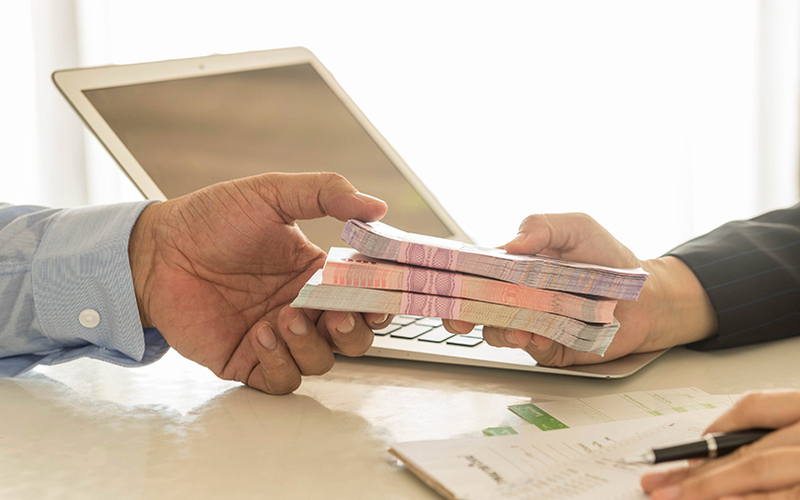 According to HDFC Bank Ltd’s annual report, the private sector lender contributes a whopping 14 employees to the list of under-40 crorepatis, 10 among whom have overseas postings. Although IT firms, such as TCS, Infosys and Wipro, had several employees who took home Rs 1 crore, or more, most were in the 40-50 age bracket, besides several others being 50-plus. The analysis also found that eight promoter directors belonging to companies based out of South India with four of them featuring in the top 10, while 14 promoter directors of firms from the western region also made it to the list. This is, however, not an exhaustive list of under-40 executives, who draw Rs 1 crore-plus pay cheques, with others perks, including employee stock ownership options.